In this unit you will learn more notes on the first string, accidentals and the eighth-note triplet. Accidentals are symbols that pair with a notes to create new notes. Three common accidentals are: the sharp (♯), the flat (♭) and the natural (♮). Sharp ♯ The sharp raises pitch up one fret. Flat ♭ The flat lowers pitch down one fret. Natural ♮ The natural cancels the effect of a sharp or flat. In this example, ‘F’ is played as the first fret/first string. ‘F♯’ is played as the second fret/first string. 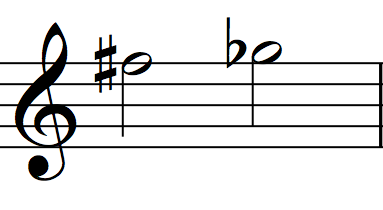 Since they produce different pitches, they are considered different notes. In this example, ‘G’ is played as the third fret/first string. ‘G♭’ is played as the second fret/first string. In this example, ‘F’ is played as the first fret/ first string; ‘F♯’ is played as the second fret/first string; ‘F♮’ is played as the first fret/first string again. The natural symbol cancelled the sharp of the previous note. Notice how the placement of the accidental in speech and writing is different from the placement of the accidental in music notation. For example, the sharp symbol follows the note when we say or write ‘F♯,’ whereas the sharp symbol precedes the note in music notation. Accidentals apply to successive notes on the same staff position for the remainder of the measure in which they occur, unless explicitly changed by another accidental. The effect of the accidental ends once a barline is passed (there is one exception to this rule, which will be discussed below, under the heading The Tie & Accidentals). In the example below, the ‘F’ on beat one is played as the first fret, the ‘F♯’ on beat two is played as the second fret and the ‘F♯’ on beat three is played as the second fret as well. 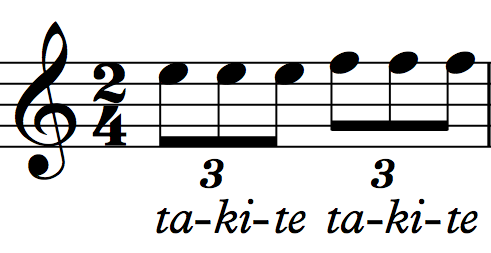 The note on beat three is indeed an ‘F♯’ even though the sharp was not added to it in the score. In the example below, the ‘F’ on beat one is played as the first fret/first string, the ‘F♯’ on beat two is played as the second fret/first string and the ‘F’ on beat three is played as the third fret/fourth string. The note on beat three is an ‘F’ (not and ‘F♯’) because the ‘F’ on beat two is a different staff position than the ‘F’ on beat three. Did you notice in the first two examples that ‘F♯’ and ‘G♭’ are both played as the second fret/first string? ‘F♯’ and ‘G♭’ create the same pitch. For that reason, we call them enharmonic equivalents. Enharmonics (for short) are notes that create the same pitch, despite being notated differently. If you are curious to know more about enharmonics, you may enjoy taking a music theory course. F♯ and G♭are enharmonics. To play ‘F♯’ and ‘G♭’, fret the second fret on the first string. ‘G♯’ and ‘A♭’ are enharmonics. To play ‘G♯’ and ‘A♭’, fret the fourth fret on the first string. ‘A’ is on the first leger line above the staff. To play ‘A’, fret the fifth fret on the first string. 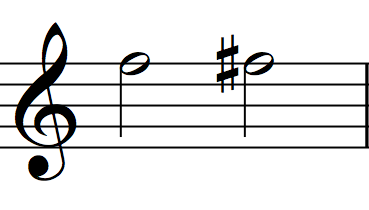 When a note that has been altered by an accidental ties to the same note across a barline, the accidental is carried through. However, subsequent notes at the same staff position in the second bar are not affected by the accidental that was carried through with the tied note. 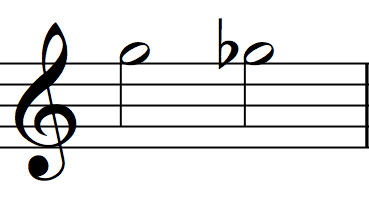 In this example, the tied note on beat one/measure two is an F♯. 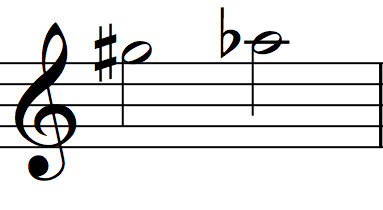 However, the note on beat two/measure two is an F natural. Some scores will include the natural as a helpful reminder. This is called a courtesy accidental. Bear in mind that some scores do not include courtesy accidentals. In this case, you are expected to know the rule and play the correct pitch. In Unit 2 you learned to subdivide the quarter note into two equal parts using eighth notes. In this unit, you will learn the eighth-note triplet, which subdivides a quarter note into three equal parts. 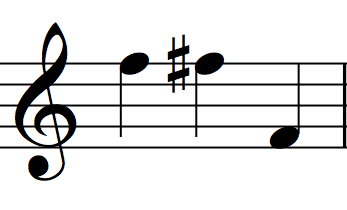 The example above features an eighth-note triplet. 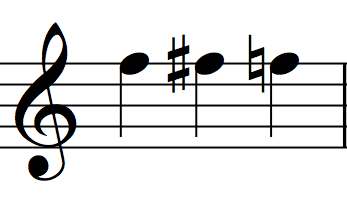 Notice that three eighth notes are beamed together along with a hovering number 3. The number 3 is what alters the math of the eighth note. In a triplet, each eighth represents one-third of a beat. Triplets can include a two-third/one-third grouping as well. 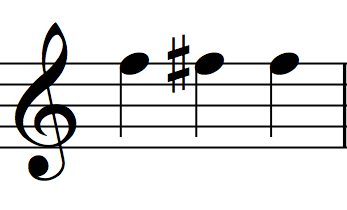 In the example above, the quarter note sustains for two-thirds of a beat and the eighth note sustains for one-third of a beat. It is important to develop the feel of the triplet subdivision through focused practice. I recommend counting triplets along with a metronome click. Set the metronome to quarter note = 80 BPM and count ‘ta-ki-te’ in the space of every click. Alternatively, you can count ‘1-trip-let, 2-trip-let.’ Make sure the subdivisions are equally spaced and that you say ‘ta‘ or the beat number at the same time as the click. Triplets have a unique feel. You will begin to intuitively transition from the triplet feel to the non-triplet feel and back after dedicated and focused practice.